Another year is almost over and what a year it has been. From the IAAF World Indoor Championships to the Commonwealth Games and European Championships plus everything in between, it’s been an action-packed 2014. Before we get stuck into 2015, we’ve gathered links to AW coverage from the past 12 months as a reminder of the biggest news in the world of the sport this year. Take a look at the links below and then why not share with us which stories really stood out for you in 2014? Get vocal and tweet us @AthleticsWeekly, drop us a line on Facebook or add a comment beneath this post or on our forum. » Sainsbury’s extended its partnership with British Athletics, the supermarket giant confirming a new four-year sponsorship deal involving major events and para-athletics. » Jessica Ennis-Hill announced she was pregnant with her first child and would therefore miss the Commonwealth Games and European Championships. » Gemma Steel was among the winners at the Bupa Great Edinburgh Cross Country as the GB team topped the points table. » Former 5000m world record-holder Sir Chris Chataway, who helped to pace Sir Roger Bannister to the first ever sub-four minute mile, died aged 82. » The Commonwealth Select squad took the team title at the Sainsbury’s Glasgow International Match. » Luke Cutts and John Lane set British records in the pole vault and heptathlon respectively. » Katarina Johnson-Thompson broke the British indoor high jump record with 1.96m in at the UK Indoor Championships Sheffield. » Morgan Lake broke the world indoor pentathlon youth best with 4284 points in Sweden. » Renaud Lavillenie cleared 6.16m to break Sergey Bubka’s 21-year-old pole vault world record in Donetsk. » Athletes paid tribute to endurance running coach Dave Sunderland. » Steve Vernon and Gemma Steel regained their English National Cross Country Championships titles at Wollaton Park. » Genzebe Dibaba set three world records in 15 days. 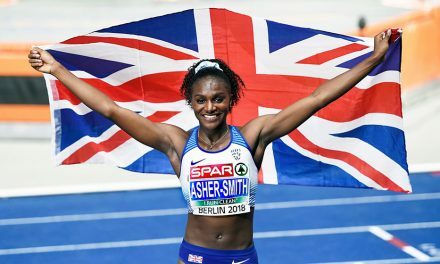 » Dina Asher-Smith and David Omoregie set British indoor under-20 records in the 200m and 60m hurdles respectively at the England Athletics Indoor Age Group Championships. 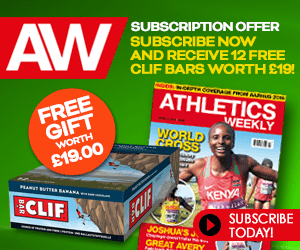 » Athletics Weekly launched a new website at www.athleticsweekly.com. » Richard Kilty won world indoor 60m gold in Sopot, with his dad Kevin later telling AW: “It’s like a Rocky story.” USA claimed the men’s 4x400m title in a world record time. » Angela Copson, Clare Elms, Anthony Whiteman and James Thie were among Britain’s golden performers at the World Masters Championships in Budapest. » Leeds and AFD won English national 12-stage men’s and 6-stage women’s road relay titles in Birmingham. » Lee McConnell announced her retirement from competitive athletics. » Kenenisa Bekele broke the Paris Marathon course record on his 26.2-mile debut. » Mo Farah ran an English record for eighth at the Virgin Money London Marathon on his debut as Wilson Kipsang won in a course record. » Greg Rutherford broke the British long jump record with a 8.51m leap in San Diego. » Russian marathoner Liliya Shobukhova was handed two-year doping ban. » Former world sprint champion Tyson Gay received a one-year doping ban. » Morgan Lake broke the British youth heptathlon best when winning Multistars in Florence. 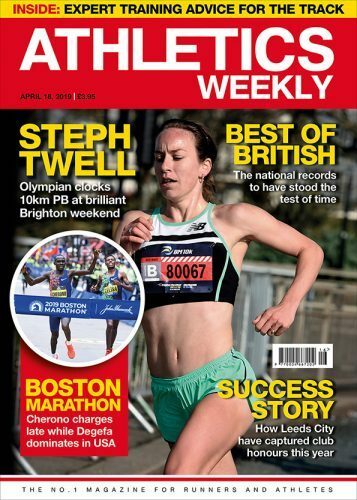 » May 6 celebrated the 60th anniversary of the first sub-four-minute mile by Roger Bannister and AW produced a bumper, special issue to celebrate the milestone. » Steve Way claimed National 100km victory in a British road record time. » Adam Gemili was among the BUCS champions in Bedford. 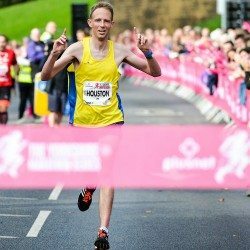 » Andy Vernon and Jo Pavey won British 10,000m titles at the Highgate Harriers event. » Double Commonwealth Games champion Leon Baptiste announced he would be hanging up his spikes to concentrate on a coaching career. » Athletics Weekly readers voted Sebastian Coe as the ultimate supermiler. » Kenenisa Bekele and Tirunesh Dibaba won the Bupa Great Manchester Run. » Morgan Lake and David Omoregie set UK junior records in Loughborough. » Hannah Cockroft continued her world record-breaking ways at the IPC Athletics Grand Prix in Nottwil. » Jamaica broke the 20-year-old world 4x200m record in one of a number of record-breaking performances at the inaugural IAAF World Relays in the Bahamas. » Galen Rupp broke the US 10,000m record at the Prefontaine Classic. » Aled Davies set a world discus record in Italy. » Katarina Johnson-Thompson won the Hypo Meeting in Gotzis with a world-leading PB. » Chijindu Ujah ran a 9.96 100m in Hengelo for a UK under-23 record and to move to third on UK all-time list. » Germany won the European Team Championships on home soil as Great Britain ended the weekend in fifth. » David Omoregie broke the European junior 110m hurdles record in Bedford. » Eden Francis was among the winners at the Sainsbury’s British Championships in Birmingham as she sealed a shot and discus double. » There were many record-breaking performances from the class of 2014 at the ESAA Championships in Birmingham. 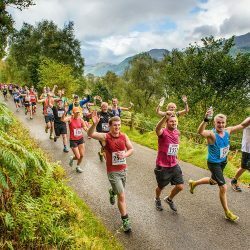 » Georgia Malir was among the winners at the European Mountain Running Championships. » Jessica Ennis-Hill gave birth to her first child, Reggie Ennis-Hill. » David Weir was among the winners at the Sainsbury’s Anniversary Games. » Katarina Johnson-Thompson was forced to withdraw from the Commonwealth Games through injury and would later also miss the European Championships. » Dina Asher-Smith and Morgan Lake were among the gold medal-winners at the IAAF World Junior Championships in Eugene. » Shona Richards was another of Britain’s world junior medallists as she won world junior 400m hurdles silver on the penultimate day of action, breaking the British junior record in the process. » Gareth Warbuton and Rhys Williams were withdrawn from Wales’ Commonwealth Games team following doping violations. 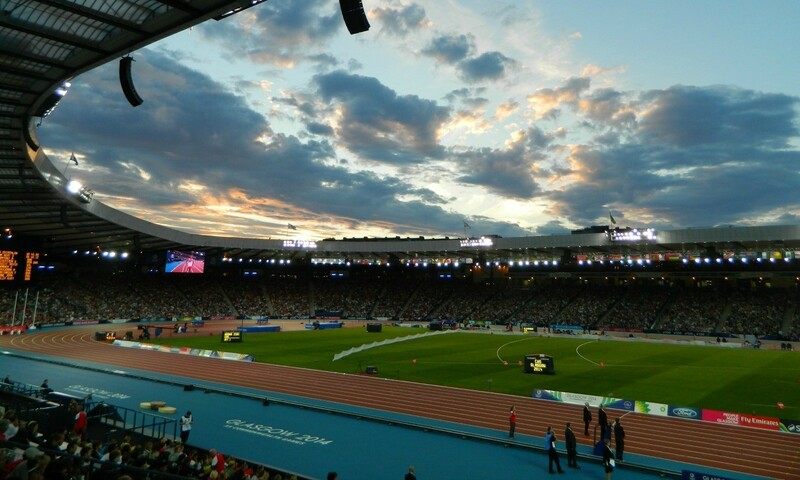 » Greg Rutherford, Libby Clegg, Steve Lewis, David Weir and Dan Greaves were among the gold medal-winners at the Commonwealth Games in Glasgow, while Scotland’s Lynsey Sharp impressed in front of a home crowd as she overcame illness to win 800m silver. Jo Pavey battled to a brilliant bronze in the 5000m. » Blessing Okagbare claimed a 100m and 200m sprint double for Nigeria at the Games. Kirani James broke the 400m Games record, while Kenya topped the medals table overall, assisted by a gold in the javelin by Julius Yego. » Amantle Montsho failed a doping test at the Commonwealth Games. » Great Britain won 12 gold medals, five silvers and six bronzes to top the medal table at the European Championships in Zurich and secure their best ever haul at the event. British golds came from Jo Pavey in the 10,000m, Mo Farah in the 5000m and 10,000m, Tiffany Porter in the 100m hurdles, James Dasaolu in the 100m, Martyn Rooney in the 400m, Adam Gemili in the 200m, Eilidh Child at 400m hurdles, Greg Rutherford in the long jump and relay victories in the men’s 4x100m and 4x400m and women’s 4x100m. » Hurdler Andy Turner announced his retirement from competitive athletics. » Following her European 10,000m gold, Jo Pavey told AW why motherhood has been no barrier to her increasing success. » Yohann Diniz broke the world 50km walk record at the European Championships. » Jonnie Peacock, Samantha Kinghorn and Hannah Cockroft were among the winners on the first day of IPC Athletics European Championships action in Swansea, while Aled Davies and Maria Lyle were also among those to claim Euro titles. » Dan Greaves threw a European discus record when winning the F44 title in Swansea. » Mo Farah set a European two-mile record at the Sainsbury’s Birmingham Grand Prix. » Isobel Pooley cleared 1.96m in Germany to break the British outdoor high jump record. » Anita Wlodarczyk threw 79.58m at ISTAF meeting in Berlin to set a world hammer record. » Asha Philip, Ashleigh Nelson, Anyika Onuora and Desiree Henry broke the British 4x100m record at Weltklasse Zürich just 11 days after a British quartet had broken it at the European Championships. » GB finished second on the medal table at the European Veterans’ Championships in Turkey. » Respected coach John Le Masurier died aged 97. » Mutaz Essa Barshim cleared 2.43m to provide a terrific end to the 2014 Diamond League series in Brussels. » Christine Ohuruogu and Laura Muir were among the winners at the Great North CityGames. 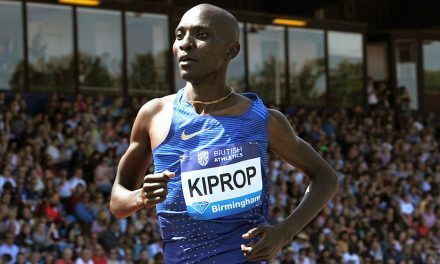 » Mo Farah and Mary Keitany were victorious at the Bupa Great North Run, clocking the quickest ever half-marathon by a British athlete and breaking the women’s course record respectively. » Oscar Pistorius was found guilty of culpable homicide following the Valentine’s Day shooting of his girlfriend, Reeva Steenkamp. » Tiffany Porter broke the UK 100m hurdles record at the IAAF Continental Cup. Team Europe were victorious overall with James Dasaolu among the winners. » GB won team medals at the World Mountain Running Championships in Italy. » Dorothy Tyler, the first British woman to win an individual Olympic medal in athletics with high jump silver in 1936, died aged 94. » Dennis Kimetto broke the world marathon record with 2:02:57 in Berlin. » Three-time world hammer bronze medallist Zhang Wenxiu was stripped of her 2014 Asian Games gold after testing positive for a banned substance. » Scientists reiterated that the effects of doping could be lifelong. » Oscar Pistorius was handed a five-year sentence for the culpable homicide of his girlfriend, Reeva Steenkamp. » Former world 800m champion and Olympic silver medallist Mbulaeni Mulaudzi died aged 34 in a car accident. » Prosecutors announced that they would appeal the Oscar Pistorius verdict and sentence. A judge later ruled that the conviction could be appealed. 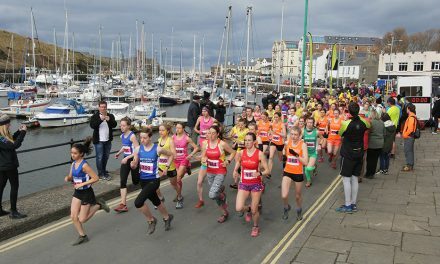 » Belaynesh Oljira won the Great South Run from Gemma Steel as James Rungaru won the men’s elite race. » UK indoor 400m record-holder Nicola Sanders announced her retirement. 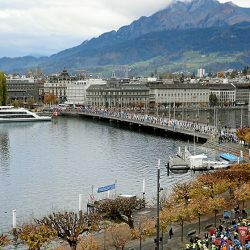 » The World Marathon Majors awards ceremony was postponed following reports of Rita Jeptoo’s positive test. » UKA named its funded athletes for 2014-15. » Tirunesh Dibaba announced she was pregnant with her first child and will therefore not defend her world 10,000m title. » Doha won the race to host 2019 IAAF World Championships. 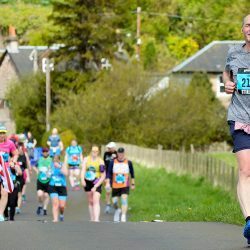 » Ellie Greenwood regained the IAU 100km World Championships title she won in 2010 having earlier on in the year won the famous Comrades Marathon, while Max King claimed victory in the men’s IAU event in Doha. » Seb Coe revealed his IAAF presidential campaign manifesto. » Russia was accused of systematic doping, corruption and cover-ups in a German television documentary. » Mutaz Essa Barshim and Valerie Adams were voted among the winners in the AW Readers’ Choice Awards. » A German TV documentary accused the IAAF of ignoring ‘suspicious’ blood values. 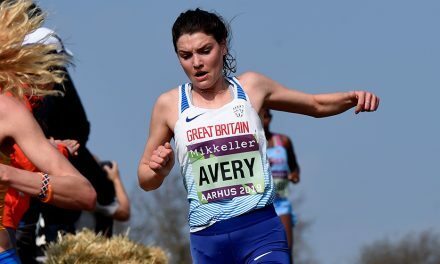 » Britain topped the Euro Cross medal table with nine medals in Bulgaria, led by Gemma Steel’s win over Kate Avery in the senior women’s race. » Jo Pavey was voted third in the BBC Sports Personality of the Year awards. » The IAAF confirmed that there are to be finals in every athletics session at the Rio 2016 Olympics. » Jon Drummond was banned for eight years for ‘multiple anti-doping rule violations’. » Rita Jeptoo’s ‘B’ sample tested positive. » Adam Hague broke the world youth indoor pole vault best with 5.46m in Manchester. » Seven British athletes made the top five in their events in the 2014 world merit rankings.